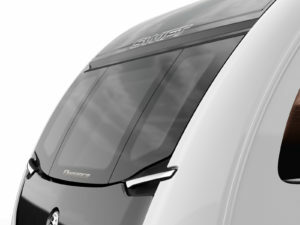 Representing decades of experience and built on countless innovations, including the ultimate SMART HT construction, the Swift Elegance offers an exquisitely refined touring experience that is second to none. Lavishly appointed and perfectly proportioned with improved layouts and a new twin axle model, the Elegance range ensures your touring is as comfortable as it is memorable. Sporting new chrome effect grab handles, an enhanced stylish graphics scheme and handy new reversing camera the Swift Elegance effortlessly stands out from the crowd.